Although many of us take beans for granted—barely giving them a thought when planning our grand and even our everyday menus—could we really do without the manifold members of the legume family? 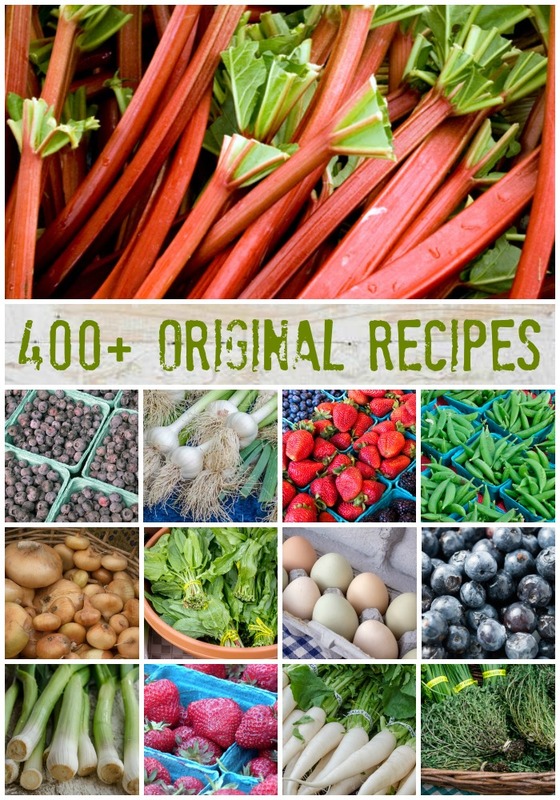 String beans, sugar snap peas, snow peas and yard-long beans—eaten pods and all; fresh shelled green peas, fava beans and lima beans; and a plethora of dried beans—kidney beans, navy beans, cranberry beans, Great Northerns, pink beans, garbanzos, black beans, pinto beans, green and yellow split peas, and yes—the tiny, toothsome lentil. In the dried bean category, it is perhaps the destiny of the delicate, earthy lentil—a bean among beans—to raise legume consciousness to new levels in America. Along with the gorgeous and tasty black bean of South America, lentils, originally from Southwestern Asia, are on the rise. 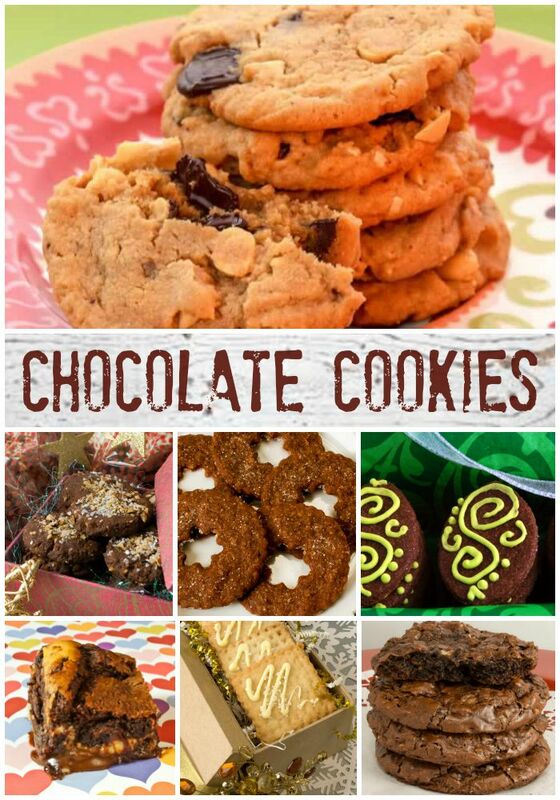 They appear in innovative cookbooks and restaurants up and down the West Coast with recurring frequency. One of the reasons for their increased popularity, I believe, is ease of preparation. Most dried beans need to be presoaked; lentils do not. Lentils go from the package to the table in a little as 20 minutes, depending on the variety used. That puts them squarely in the rice and pasta category for ease and speed. A Hindu proverb says, “Rice is good, but lentils are my life.” Lentils are, in fact, nutritional dynamite; 112 grams of protein per pound as compared to 59 grams per pound for T-bone steak. Now, the usability of bean protein has been in question since the 1971 debut of Frances Moore Lappe’s, Diet For A Small Planet, in which she espouses a very complicated formula for combining the various proteins contained within the plant kingdom to achieve “protein complementarity”—all eight “essential” amino acids in one meal. (Actually, there are 23 essential amino acids, but the human body produces 15 of them on its own.) The theory states that in order to get “complete” protein in a vegetarian diet, you must eat beans at the same time as either cereals or grains, nuts or seeds, rice, or dairy products—in certain important proportions. This may be technically correct, but unfortunately it has caused unwarranted concern in many people’s minds—all this worry about whether we are getting enough protein. Actually, protein deficiency is extremely rare in this country and protein over consumption is more the problem. Information from scientists of late claims that the body has a reservoir of available amino acids held within the bloodstream; these can be pulled to produce complementarity at any time. Beans eaten with or without their complements, as part of a varied diet, ensure that adequate protein levels are maintained. On a national scale, Washington State ranks first in the production of lentils and dry edible peas; Idaho ranks second, and Montana ranks third. 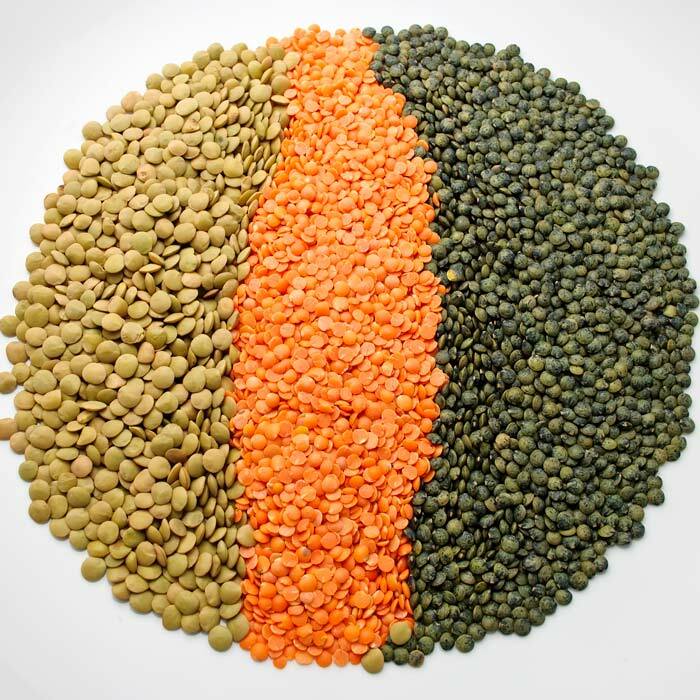 Together, they produce the Chilean Green lentil (which is actually brown), the smaller Red Chief lentil, which is bright orange in the dried state and vivid gold when cooked, and Black Beluga, Brewer, Emerald, Eston, French Green (Du Puy), Laird, Pardina, and Richlea lentils. 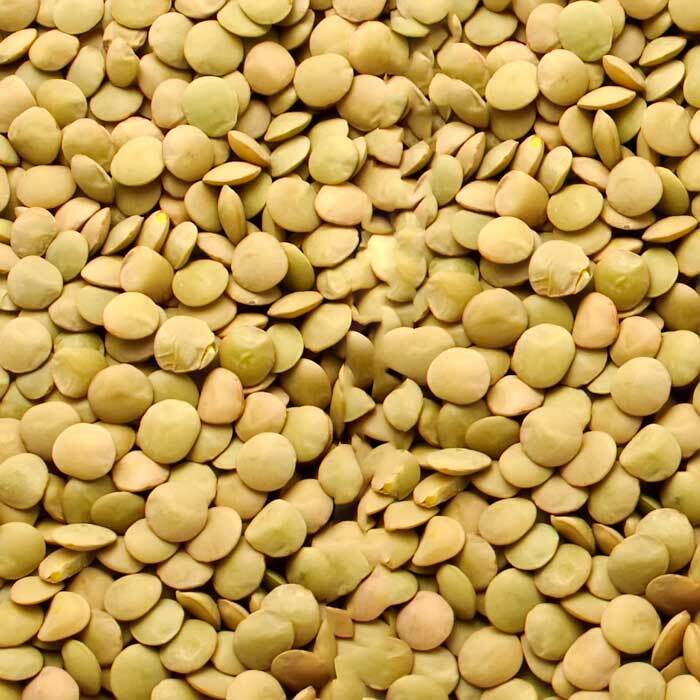 They also produce enormous quantities of green split peas and a lesser quantity of yellow split peas. 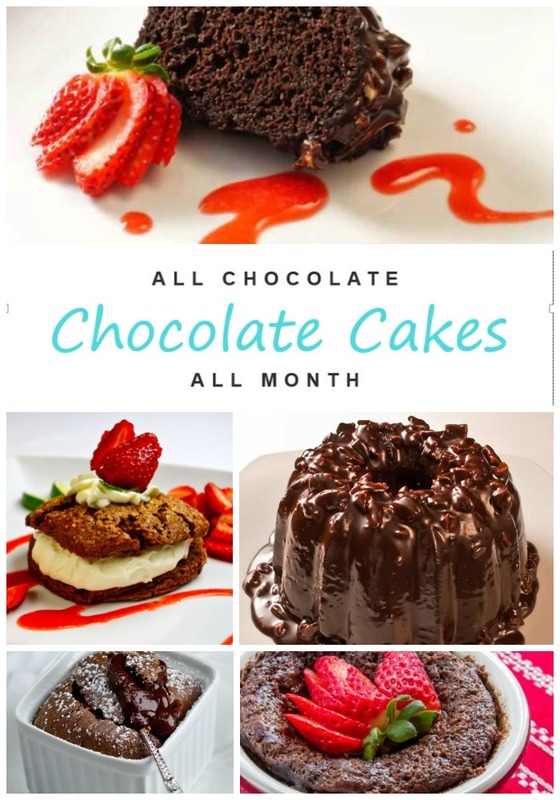 All of this production takes place along a 50-mile-wide strip that runs 200 miles north to south from Spokane on the Washington side of the Washington-Idaho border to Grangeville on the Idaho side. This area is known as the Palouse region. The dry climate makes it possible to dry the crops in the field before harvesting; all natural; no chemicals or drying houses. Oregon and North Dakota also produce lentils. Seeded in April and harvested in August, lentils are dried—making them a year-round staple. It used to be that you could find only two types of lentils in the Northwest: Red Chief and Green Chilean (actually brown) lentils. 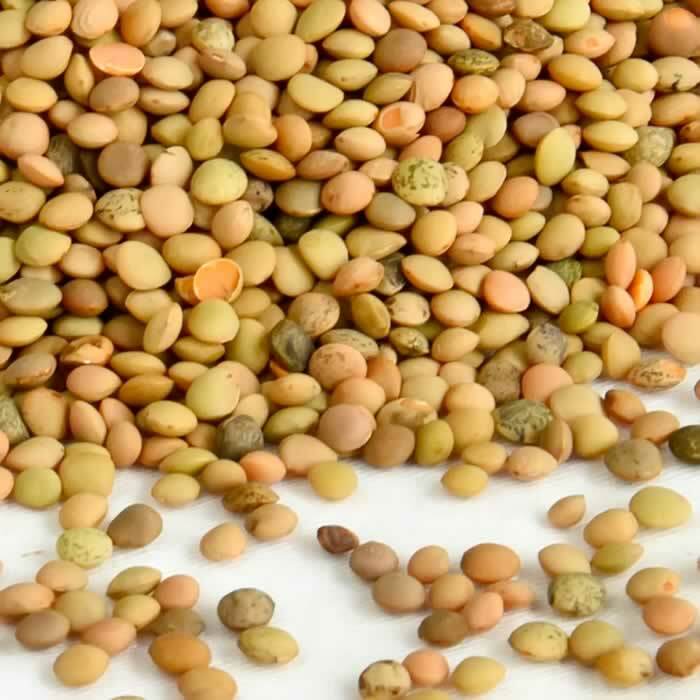 Green Chilean lentils are available in nearly every supermarket. Red Chief lentils and other more recent lentil entries to the market are easier to find in specialty markets. Be prepared to pay as much as $7.00 a pound for some of the rarer offerings. When selecting lentils, make sure they appear dry and free of extraneous debris. Perhaps the prettiest of the lentils, Red Chief lentils are tiny and orange hued. You may not find Red Chief lentils in typical grocery stores, but they are often available in health food stores or specialty food markets. Ask for local Red Chief lentils; imported Persian red lentils are not as tender as Red Chiefs and take twice as long to cook. 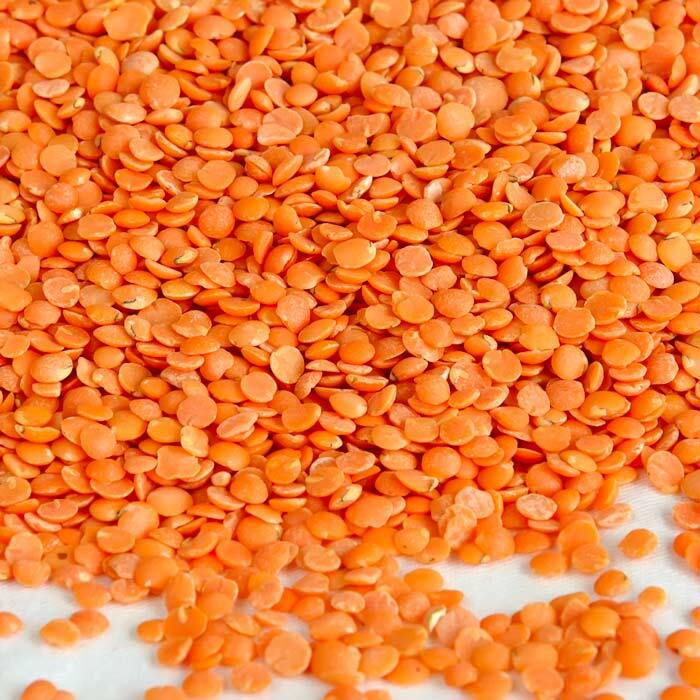 Red Chiefs are sold whole and are quite a bit larger than Persian red lentils, which are usually sold split. Red lentils do not hold their shape very well during cooking, so it is important to match them to recipes in which a mash or puree is desired. 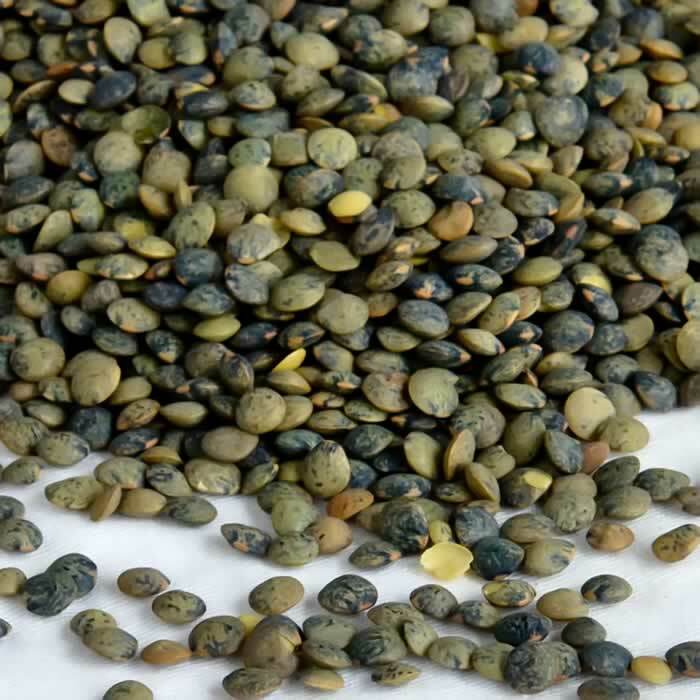 Despite the misleading name, this is the khaki-tan hued lentil that many of us associate with the Northwest, as until recently it was the most commonly available variety. Beautifully flavored, Chilean Green lentils hold their shape and color well during cooking. 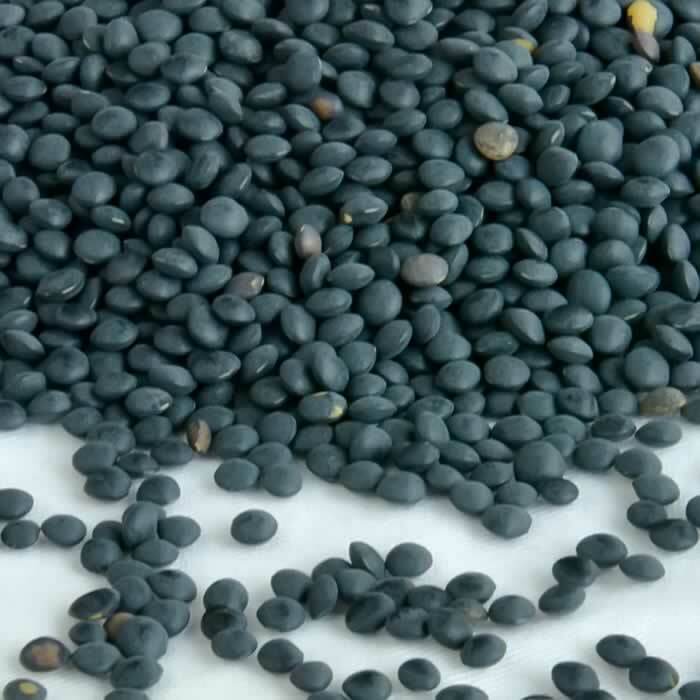 These black beauties are the cavier of lentils. Black Beluga lentils are even smaller than Red Chief lentils, slightly more rounded, and just as striking in their own way. 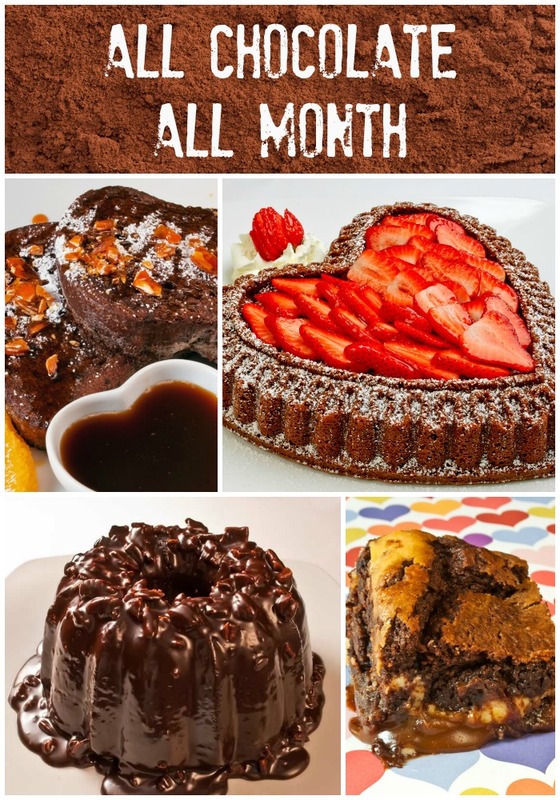 Softening to a rich dark brown, they glisten when cooked, hold their shape, and have a warm, nutty flavor that lends itself to a wide range of spices. 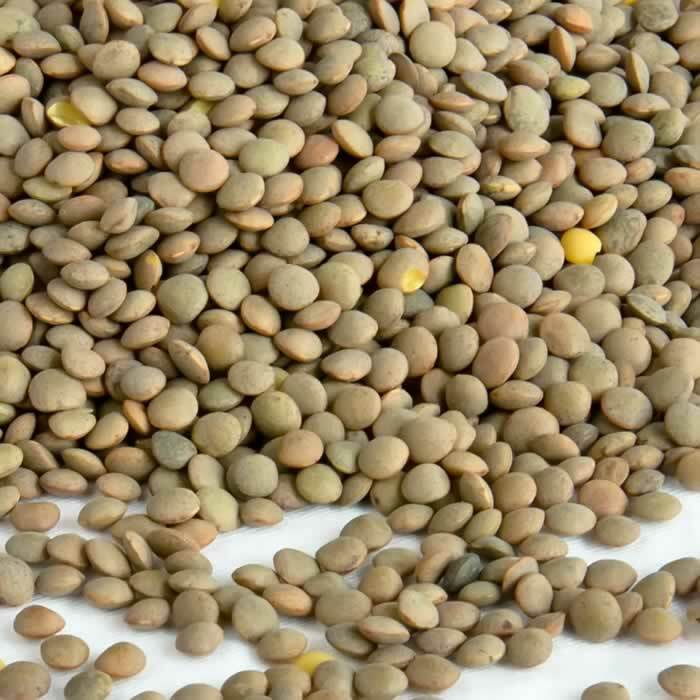 French Green (also called Du Puy) lentils are varigated shades of lovely dark, muted green. If you didn’t know that the photograph above pictured entils, you might think it was a collection of gorgeous beach pebbles. French Green lentils have a rich flavor and remain firm when cooked. Spanish Lentils are medium-sized and a soft, grey-brown hue. Smaller and rounder than Green Chilean lentils, they are said to hold their shape better during cooking, although I have yet to confirm this. Umbrian lentils are beautifully varigated in shades of golden pale orange, tan, and pale green. I have yet to cook these, so will report back later on cooked flavor and texture. Store dried lentils in an airtight container in a cool, dry location. Lentils do not need presoaking. Just rinse, check for foreign debris, and cook. 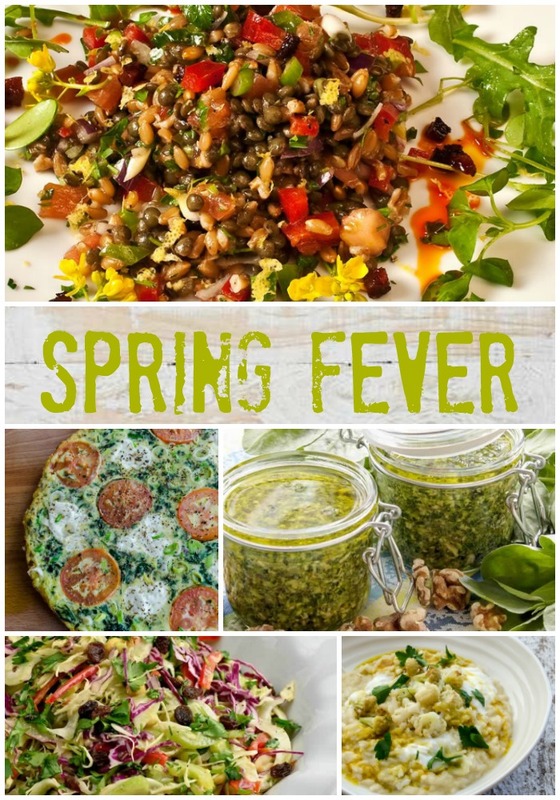 The mild, earthy, almost nutty taste of lentils complements many other foods. Use in conjunction with onions, tomatoes, cream, yogurt, cheese, Italian or Polish sausage, fresh pumpkin, toasted walnuts, garlic, pasta, rice, oregano, basil, bay leaf, cumin, cinnamon, chili powder, and chili peppers to name only a few. 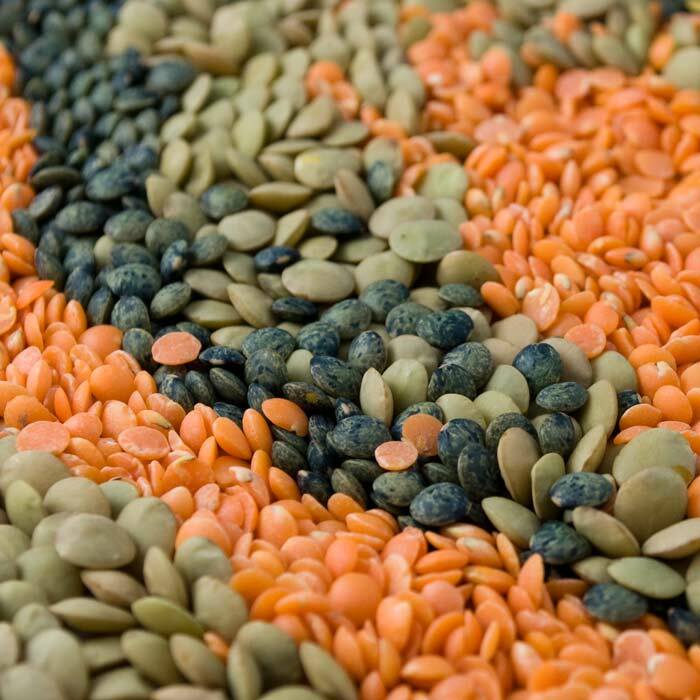 Green Chilean lentils are more assertive in taste than Red Chief lentils and hold their shape nicely when cooked. Red lentils tend to disintegrate at the surface by the time they are fully tender at the center. Thus, you need to time the cooking with some exactness or use Red Chief lentils as a puree. Acidic ingredients, such as tomatoes or lemon juice, should be added only after lentils are cooked to the desired tenderness. A squeeze of fresh lemon juice near the end of cooking brightens the earthy flavor associated with some lentil varieties. Don’t salt the water when you cook lentils; it toughens the outer coating. Don’t cook lentils in aluminum or cast iron pans. These metals inhibit cooking and affect the color of the lentils. Lentils, peas, and chickpeas should be cooked al dente; tender, but not mushy. To cook 1 pound of Green Chilean lentils, combine with 5 cups of water in a large saucepan and bring to a simmer. Cover and cook for 30 minutes. If you want a puree, cook for 45 minutes. Season and use as desired. To cook 1 pound of Red Chief lentils, cut the water to 4 cups and cook for 10 minutes if you want to retain some shape; 20 minutes if you want a puree. Bacon, bay leaf, bell peppers, butter, cardamom, carrots, celery, chile peppers, cilantro, cinnamon, cream, cumin, curry, garlic, ginger, goat cheese, ham, honey, leeks, lemon, lime, olive oil, onions, orange, parsley, peanuts, prosciutto, pumpkin, sausage, smoke, sweet potatoes, thyme, tomatoes, vinegar, walnuts, red wine.